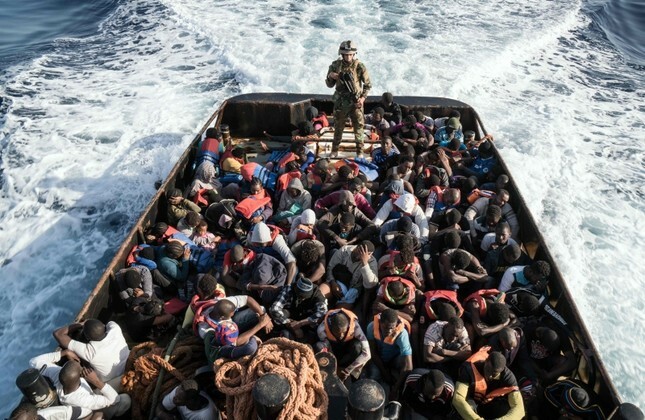 Chaos in Libya following General Khalifa Haftar's offensive has increased the risk of terrorist presence on migrant boats headed for Italy, Interior Minister Matteo Salvini said, adding the country's ports would remain closed. "Terrorist infiltration is no longer a risk, it has become a certainty: it is therefore my duty to reiterate that no docking will be allowed on Italian shores" he said Wednesday in a radio interview. Salvini, who is also a deputy prime minister, signed a new directive Tuesday against charity vessels rescuing migrants off Libya, targeting the Italian ship Mare Jonio in particular. He warned that the Mare Jonio and others must obey the orders of authorities in foreign search and rescue regions — a reference to the Libyan coastguard. The minister had issued a first directive on the laws regarding rescue operations in March, saying there would be "sanctions" for those who explicitly violate international, European and national rescue regulations. Charity ships have drawn fire from Rome by attempting on occasion to stop migrants being taken back to crisis-hit Libya, which human rights organisations say is not safe for repatriations. Salvini, leader of the anti-immigrant League party, refused to say if Italy's stance could change in case of a full-fledged war in Libya after the flare-up in the cycle of anarchy gripping the country since dictator Muammar Gaddafi was toppled in 2011.